Detailed information relevant to the regulations and the organization of undergraduate studies are to be found in the annual Undergraduate Studies Guide. The degree structure of the Department of History & Archaeology covers nine major subject areas: 1) Prehistoric Archaeology, 2) Classical Archaeology, 3) Byzantine Archaeology, 4) History of Western Art, 5) Ancient History, 6) Medieval History of Byzantium, 7) Medieval History of Western Europe, 8) Modern History, and 9) Ottoman History. The degree courses of our Department are supplemented by modules offered by the Department of Philology and the Department of Philosophical and Social Studies (all three departments belonging to the Faculty of Letters). The degree structure enables students to develop their own curriculum according to their personal interests. More specifically, students are required to complete successfully a certain number of modules within each major subject area, but they are free to choose which particular modules they will attend and in which semester. Modules offered by the Department of History & Archaeology have different subjects every semester. Moreover, during the four years of their undergraduate studies they have a large choice of modules offered by other departments of the Faculty of Letters. 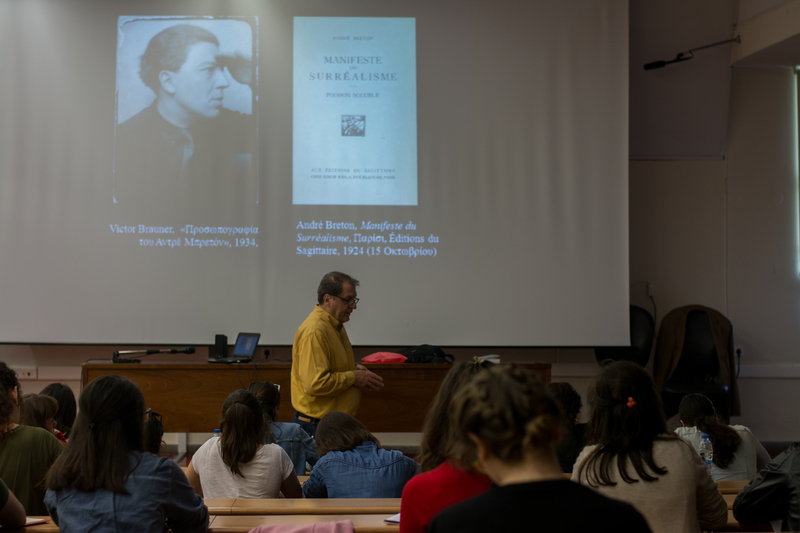 It is advisable though that first-year students give priority to introductory modules, as well as modules in ancient Greek and Latin literature. The modules offered by the Department include lectures and seminars. Lectures explore general or particular fields of study, while seminars aim at training students in research into specific topics. Participants in seminars do not exceed the number of 25; they must have completed the first year of their studies and they must have successfully completed at least two lectures relevant to the seminar’s subject. Seminar attendance is compulsory. The successful completion of a lecture module is based on written or oral examinations at the end of the semester, or by alternative assessment methods decided by the module convener; in the latter case students have to be informed about them at the beginning of the semester. In seminars students are assessed on the basis of one or more written essays, as well as upon their oral performance and general participation in class. Undergraduate studies are organized in two major Degree Courses: Course Α (History) and Course Β (Archaeology and Art History). Students are required to choose one of them during the second year of their studies, and to select their modules on the basis of the requirements of each course curriculum. The lectures which they have successfully completed during the first year of their studies are integrated in the Degree course they choose to follow. To obtain their degree, students of Course A should complete successfully 36 lectures and 6 seminars, or 38 lectures and 5 seminars, or 40 lectures and 4 seminars. Students in Course B should complete successfully 36 lectures and 6 seminars. Each lecture offered by the department corresponds to 5 ECTS Credit Units and each seminar to 10 ECTS Credit Units. ECTS units refer to a European Union system of calculating the amount of work required for each module, in other words the number of hours spent by students to attend, study and prepare for examination in the modules in which they have enrolled. To obtain their degree, students need to complete successfully lectures and seminars corresponding to 240 ECTS units (that is in 36 lectures and 6 seminars, or in 38 lectures and 5 seminars, or in 40 lectures and 4 seminars, as explained above). The academic year is divided in two semesters, each one including at least thirteen weeks of lectures and seminars, each module lasting three hours weekly. The winter semester generally lasts from the last third of September until the last third of December, while spring semester lasts from the middle of February to the end of May. The examination periods follow the thirteen-week teaching period, taking place in January for winter semester modules and in June for spring semester modules. Students who have failed in or did not take the exams in January or June, can do so in the examination period of September. Students in the fifth or more year of their studies can also be examined during the examination period of January for modules they have selected during the previous academic year (Third examination period). Students’ performance in courses is graded from 1 to 10. Grade 5 is the minimum required for successful completion of modules. To receive their degree, students should successfully complete their studies in one of the Degree Courses described above (Α. History and Β. Archaeology and Art History), according to the Guide to Undergraduate Studies corresponding to the year of their enrollment in the Department. The Erasmus+ program enables students to study for one academic semester in a foreign University Department with which the Department of History & Archaeology has signed a relevant agreement. Students moving to a foreign University must select modules corresponding to a total of 30 ECTS Credit Units per semester. Modules successfully completed in the context of Erasmus+ exchange program are credited to the students’ course curriculum at the University of Crete. Attending foreign languages modules, offered by the Faculty of Letters, is optional for students of the Department. This possibility is nevertheless useful for learning or perfecting their knowledge of one or more foreign languages, and essential for the use of scholarly literature in foreign languages, often required for lectures and seminars. The grades attained in foreign language modules do not count towards the students’ final degree grade, but are recorded in the accompanying analytical appendix.